Is China's turmoil the next Lehman Brothers? I am taking a break from physics topics to discuss a hot topic of the day: the extreme turmoil on the stock markets due to trouble in China. I am not sure how the system works in other countries, but in US your retirement funds, your nest egg, is usually tied to the stock market fortunes as the largest investors are mutual funds. Every person have his or her tolerance to fluctuations and loss but major evaporation of retirement funds can be very nerve racking. Since I got burned in the past and learned from my mistakes, I want to share some common sense advice you will not easily find otherwise. The first observation is that unless you are a serious investor willing to commit time and resources into researching individual stocks it makes little difference overall on which mutual fund you select. Each mutual fund is already diversified and by watching how the DOW does you have a pretty good idea how your investments are doing. For the usual ups and downs of the market you do not need to worry at all, you will have an average return of about 8%, but what to do when there are violent price movements like the recent ones? One of the most imbecile advice typically found on CNN by their so-called experts like Richard Quest is that you should not panic and ride out the storm. Is there a topic he is not qualified in? But when the losses exceed 8, 9, 10% this shows that major events are happening and it is not the time to stick your head in the sand and pretend it is business as usual. It is true that overreacting is bad and usually the ordinary investor crowd bets incorrectly. So you need expert advice to understand what is going on, but where do you get such a thing? One possible source is o reach out to your financial adviser, but in general this is not a good idea because those guys make money when you buy stocks and they do not offer unbiased advice. They usually give you the same cookie cutter nonsense of investing for the long term. So you have to realize that you cannot get good financial advice during an unfolding crisis and you should follow the money instead. when DOW drops significantly but the volume is close to the average, don't panic and do nothing. when DOW drops significantly and the volume is two to three times the average it is time to sell. The large players decided that the outlook is negative. when DOW increases significantly but the volume is close to the average, do nothing. when DOW increases significantly and the volume is two to three times the average it is time to buy. The large players decided that the outlook is positive. Sure, you will miss the first big drop, and the first large increase, but in the long term this does not matter. This advice is for the investors who don't have the stomach for large drops in value. If your tolerance for risk is higher or you have the luxury of a really long term investment period measured in many decades then you should not care about the stock market antics in the first place. Now on the current China turmoil. Is this a short storm, or the harbinger of a larger trouble like the Lehman Brothers collapse? Honestly, I don't know, and I think nobody knows either. 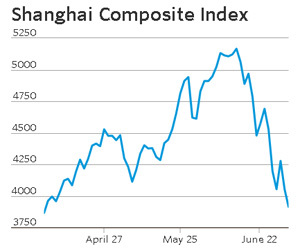 China is now the second largest economy and any turmoil there has large implications. Also the current trouble is the result of irresponsible advice from Chinese leadership to ordinary citizens to buy stocks in a get rich quick scheme. This created a bubble which now burst. But what will the effect be in the psychology of ordinary Chinese citizens? Would this create unbearable social pressure which will result in the change of the political system? Would this impact the real Chinese economy? Nobody knows because this is a first in the modern history of China. When Lehman collapsed, for a few months there was no economic pain. Everyone was reassured that "the economic fundamentals are strong" and this was just a blimp on the radar. But something funny happened: the usual economic activity simply stopped like a switch was turned off because lending between banks froze solid due to sudden lack of confidence. It took a Keynes style influx of money to get the economic engine restarted. Your ideas about the markets are even more dumb than those about quantum mechanics. The fact that stocks are the best investment isn't a nonsense fairy-tale. It's an important fact about the market. There is nothing wrong happening in China. And there is no correlation between someone's being a big institution and his having right opinions about the future. Big volumes during drops may mean and usually do mean just a big panic. The current drop - created by mindless thinking and mass hysteria that your "follow experts defined by big volumes" represents - created a great opportunity to buy stocks - and especially lots of particular stocks - at a nice discount. The economy is doing fine. Sensible companies doing business in China report that they don't observe any slowdown over there at all.And if there's some slowdown, like by a percentage point, it is being fought against by tons of policies and interventions by the Chinese central bank or other authorities. They intervened in the stock market today. Yesterday, they lowered the mandatory reserves of banks, and pumped some extra cash to the financial system, and lowered the interest rates by 0.25% etc. It's obvious that they want their 7% or higher growth rate back and with some pumping, it's always possible to get the money there. The drops have been nervous and I don't claim that I have kept all my stocks (or stock funds). I've sold a small part. It's because I just didn't expect this event - it emerged without any sensible reason whatsoever. My plans were that I could stomach a 20% decrease but the irrationality of the recent hysteria made bigger decreases possible and I just wanted to insure a bigger portion of what I have. But it's obvious that those who benefit are those who continu to hold stocks and use similar periods to increase the percentage of their holdings in stocks. Even those who bought stocks before the 2008 drop - the 2nd worst period to buy stocks in the last 100 years - saw their going to the plus a few years ago (in the U.S.) and about now (elsewhere). The average investors did a lot of investment in 2009 or 2010, however, and they saw amazing returns. I think that to advise people to sell stocks now is very likely to be one of the worst advises you may give. Lubos, talk is cheap. Exactly how much skin do you have in the game? If you have an amount you don't mind losing, buying now can be a great idea, but this kind of market timing usually doesn't work in the long run. Besides, the system is stacked against you because the transactions for the average Joe investors are executed at the price at the end of the trading day. I am not telling anyone to sell or buy now. I am explaining what worked for me in the past and everyone should use this according with their tolerance for risk. I am laughing all way to the bank about the fog of ideological BS you are pumping. Hi, I have 1/2 of my savings in stocks. The savings are supposed for me not to depend on daily work for the next 50 years if needed. All my savings are in stocks. I lost big time during the dot com bust and learned my lessons the hard way then. Using those lessons I sold just before Lehman crashed and bought back just before the market started to recover. However this was for the bulk of the money but I continued to buy stocks every month and took advantage of the great price opportunity while protecting the main amount. I don't know how this China turmoil is going to develop, but I learned to trust the judgment of experts. There is one important question: if those experts are correct most of the time, why then the mutual funds cannot avoid losses? The answer is that mutual funds are constrained by regulations to diversify and cannot put the bulk of their money in safe bets, but this does not apply to individuals. Everyone is trying to do the cleverest, most profitable thing - which is effectively picking the right experts. But your pick, as the blog post makes explicit, is a lame one. Your experts are the panic sellers during panic selling and euphoria mass guyers during euphoria buying. They are your experts but they are my mindless sheep. Lubos, the basic idea is sound, but it can be improved on. For example to improve the signal to noise ratio, the threshold should be correlated with the fear and greed index. In the current situation a good threshold is 3 times, not 2 times the average, otherwise you get a false positive from the mass panic. Statistically, the crowd is known to bet incorrectly most of the time. You will not win every time using this method, no method works 100% but your will come out ahead. After a major crises you get excellent expert analysis of what, how, and why it happened, but not when the situation is hot. The standard financial adviser is good only at one thing: recommend the right mix if stocks, bonds, and stable investments according to your tolerance for risk, time until retirement, and your personal investment goal, but they are useless otherwise (if they were they would be higher in the food chain of investing). On thing amused me at your blog: you said something like the rich people invest 50% in stocks. What a nice cargo cult thing to do. But hey, if that makes you feel rich even if your are not, I will not argue with what makes your boat float. Show me your million dollar home you own and I'll start taking you seriously in financial matters. Off topic, there was this Czech company Zelezarny Veseli who bought a large company in Romania in 1998, and the new management decided to lay off 1000 workers. When the union leader organized protests, Franmtisek Priplata (a director at another Czech company in Romania), the local director of the company where the union leader worked, and a head of a bodyguard and security company plotted to kill the union leader. The union leader was killed, Franmtisek Priplata along with all others were convicted of the murder, but Franmtisek fled Romania back to the Czech republic with a forged Hungarian passport. To this day the Czech republic refuses the extradition of Franmtisek Priplata.